Protein is the most essential nutrient that everyone feels they are not getting enough of. Indeed it’s quite difficult to make sure you get in enough protein in your diet, especially if you’re a vegetarian. Proteins are building blocks of human cells and as such are very important for the smooth functioning of our bodies. Protein is important for growth, repair and development of body tissues and is counted among the three essential macro-nutrients that your diet should be rich in. The other two are carbohydrates and fats. Including protein in your diet is essential to maintain muscle strength and muscle mass, as you age and a diet rich in protein also helps rev up metabolism for weight loss. In fact, a protein-rich diet is recommended by many health experts for effective weight management. According to a Harvard Health blog, the commonly quoted daily recommended intake of protein is as follows- 56 gm per day for men and 46 gm per day for women. This recommended allowance may vary depending on the intensity of physical activity that a person indulges in, daily. 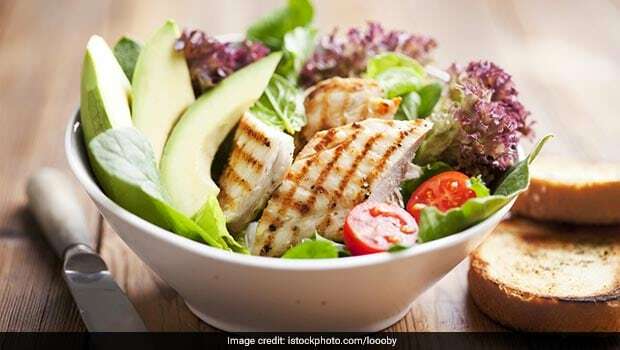 If you are engaged in heavy duty workout or a physical activity that requires high stamina and strength, you should follow a strict high protein diet plan, drawn up just for you. A commonly accepted weight-based daily recommended allowance for protein dictates that one should consume 0.8 gm of protein per kilogram of their body weight. There are some easy ways to sneak in more protein in your diet on a daily basis. Most people start their day with protein-rich eggs, which are filling, nutritious and delicious. But the whites from a single large egg only contain about 6 gm of protein (as per USDA data). You can bump up your protein intake by adding some protein-rich flaxseeds to your oatmeal porridge. Oats are also quite rich in protein and hence are considered a healthy choice for breakfast. Add some flaxseed powder to your breakfast smoothie to load up on the nutrient in your first meal of the day. During lunch, keep away from white or even brown rice and instead opt for whole wheat chapatis. Whole wheat flour contains much more protein than rice. Add a cup of plain curd or yogurt. It’s a great way of aiding digestion and adding some protein and calcium to your lunch meal. Sprinkle some flaxseeds or chia seeds to your yogurt cup. Popular protein-rich dinner ingredients include egg whites, cottage cheese, chicken breast, turkey breast etc. Again, instead of going for rice, include whole wheat chapatis or whole wheat bread in your meal. Snacking is important for weight loss. Seeds and nuts are very popular when it comes to healthy snacks. Seeds are rich in protein and so are nuts like almonds and walnuts (21 gm and 15 gm per 100 gm, respectively, as per USDA data). You can also opt for roasted chickpeas or a sprouts salad with green gram sprouts or mung beans. An easy way to meet your recommended daily allowance for protein is to break your protein intake into smaller allotments of 15 to 30 gm of protein per meal. Check with a certified nutritionist or dietitian for more concrete tips on how to include more protein in your diet and an effective breakup of macro-nutrients in each meal.